The George F. Baker Scholars Program develops students’ leadership potential. The Baker Scholars Program is dedicated to developing students' business-leadership potential. 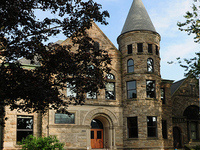 In conjunction with the Department of Economics and Business, the program focuses on three interrelated sets of activities — exposure to business leaders and centers of commerce, leadership experiences, and personal leadership development — to empower students to more effectively discern, develop and employ their gifts and calling. LEADERSHIP EXPOSURE — Participate on department-initiated trips that promote key firm relationships around the globe. Help your peers experience first-hand connections with business professionals and centers of commerce. LEADERSHIP DEVELOPMENT — Come together with other student leaders in the economics and business department and be challenged in leadership-development topics. Engage in opportunities for mentoring, self reflection, character development and personal growth. LEADERSHIP EXPERIENCE — Put your skills to use and participate in a consequential leadership project: consult with a non-profit organization or support strategic departmental initiatives. A Hope College sophomore with a minimum cumulative GPA of 3.3 for your first three semesters. A declared major in business, accounting or economics. Want to know more about Baker Scholars?